As a condition that affects both the sufferer and the bed partner, snoring is a problem that very few people seek treatment for, often feeling too embarrassed. Snoring is caused by a partial closure of the airway during sleep, due to the relaxation of the lower jaw and neck muscles. This, in turn, causes the soft tissues in your airway to vibrate, creating the snoring sound. The good news is Stamford Bridge Dental are now offering a practical solution to the problem. Sleepwell, which is worn just for sleep, holds the lower jaw in its normal position, thereby stopping the snoring sound from occurring. 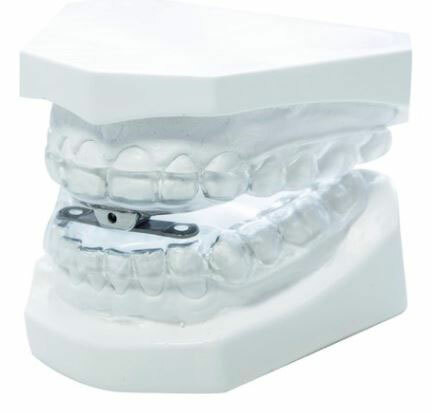 Sleepwell is custom-made to your specifications using dental impressions taken by our specially trained dentist. It has a soft inner lining for optimum comfort, allows side-to-side movement of the lower jaw and, most importantly, allows the wearer to adjust the device themselves. High levels of patient comfort meant that during clinical trials, over 97% of patients found Sleepwell an acceptable snoring remedy. Prior to being provided with a Sleepwell device, you will be asked to complete a pre-screening questionnaire in order to rule out other issues such as Obstructive Sleep Apnoea (OSA). If there is an indication that you could be at risk, your dentist will refer you for further investigation or arrange a private home sleep study. We can offer 0% finance on these products with a 20% deposit upfront to cover lab fees.